In many ways, the numbers suggest that KM is a big company game. Or is there another way of looking at it? 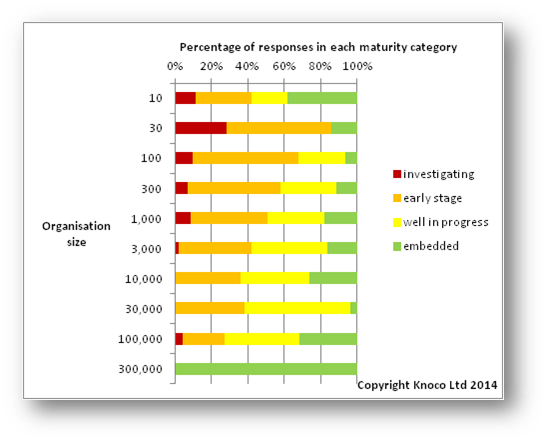 The Knoco 2014 survey of Knowledge Management continues to throw up more interesting data the longer we look at the dataset. 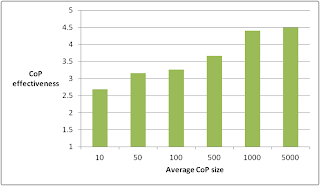 Recently I have been looking at the link between company size and KM success. Here are some of the figures (bearing in mind the caveats that most of these figures were estimated by the respondents, and that some categories may have few data points), with two possible conclusions at the end of the post. Exhibit 1 - big companies are the most KM-mature. The figure here shows that a higher proportion of the larger companies are either well under way with KM, or have KM fully embedded. This is largely because they started earlier (companies with 100s of people have been doing KM on average for 3.4 years, with thousands of people for 6.8 ears, tens of thousands for 7.5 years and over 100 thousand staff for 9.5 years). Even though KM takes longer to embed in the larger companies, but the larger companies were the first to adopt KM. The figure here shows the average annual KM budget in millions of dollars, and the average KM team size, for four company size ranges (hundreds of staff, thousands of staff, tens of thousands, and over 100 thousand). Although both KM team size and KM budget increase with company size, this is not a linear increase. Increasing the company size tenfold does not increase the KM team size tenfold, nor the budget. There is an economy of scale. Many of the KM activities, such as developing a KM strategy and framework, conducting audits and assessments and so on, need to be performed by both large and small companies alike. The type example here is communities of practice. 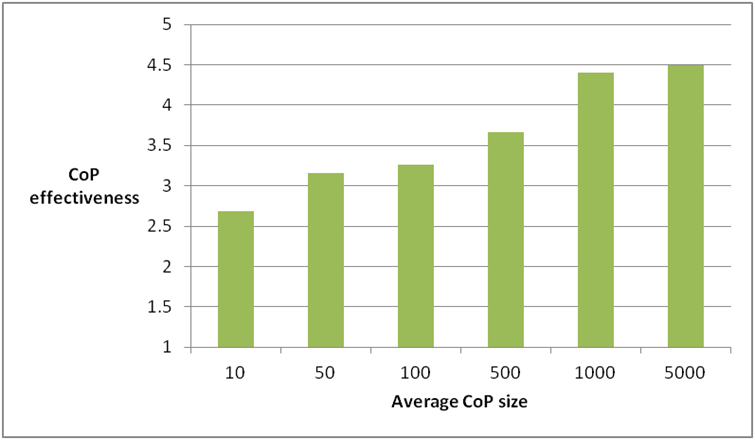 This figure shows the average effectiveness rating assigned to communities of practice by survey respondents for each category of CoP size. The trend is striking. Larger communities work the best, as you might expect. We could extrapolate this - larger companies have larger bodies of knowledge, they can make more connections, and they can deliver greater value. Here we need to show a table, rather than a graph, in order to be able to see the figures. 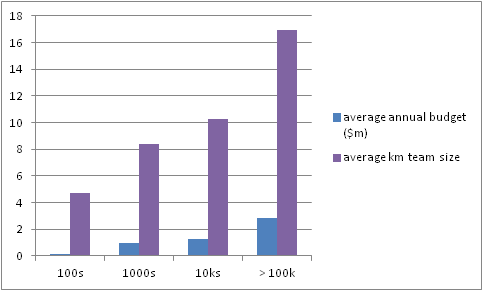 The benefit derived from KM does appear to increase roughly tenfold as company size increases tenfold. There is a linear value between organisation size and KM value, even though the relationship with budget is non linear. So bigger organisations get correspondingly bigger value without correpondingly bigger investment. (Note that the value increase from ten-thousands of staff to hundreds of thousands of staff is not a tenfold increase, possibly because the "hundreds of thousands" companies are mostly in the low hundreds of thousands). The most obvious conclusion from all of this would be that KM is a big-company game. The larger companies embraced KM early, and have been doing it for a long time, because it makes economical sense. Their scale delivers great value, while they can apply economies of scale to the KM budget and KM team. For the larger companies, ROI can be in the order of 10 to 20 fold or more. For smaller companies, the investment will not be as big, but the value and the ROI will be significantly smaller (smaller companies may have single-digit ROI from KM). There is an alternative conclusion, which is more reassuring to the smaller companies. This conclusion would be that the large companies have got the greatest value simply because they have been doing KM long enough for it to become embedded. Companies with hundreds of staff, for example, have rarely reached the "embedded" stage with KM, and it is only in the later stages that the value really begins to be delivered. 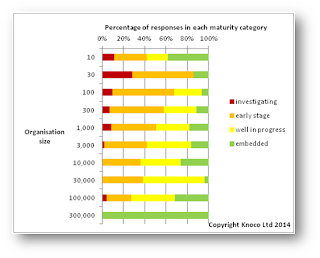 So possibly Knowledge Management has been a big-company game SO FAR - but the smaller companies may have been at too early a stage in their KM journeys to be seeing the real benefit. They may only now be reaching a position where the full value of Knowledge Management will be seen. Perhaps the day of the medium-sized knowledge-enabled companies is just dawning? Great discussion. I am writing a paper about KM for freelancers and I believe the main question is not the management but how we develop tools and skills to learn alone and collectively. That creates the real value. The management only optimizes it. It can't create the value by itself. Dear Nick Very interesting survey findings.